Ryan’s plan, which he described during a conference call with Republican lawmakers, seems unlikely to quell the partisan showdown that has intensified since the June 12 mass shooting in Orlando, Florida. Two Republicans said the House is expected to vote on legislation resembling a National Rifle Association-backed bill that the Senate rejected last week after it was opposed by most Democrats. 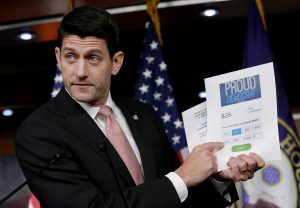 Ryan, R-Wis., said the House will consider broad legislation also aimed at preventing extremist groups from radicalizing and recruiting sympathizers. He said lawmakers will also vote on a measure aimed at buttressing mental health programs. Ryan said it is “just common sense” to keep firearms from terrorists, but he said it must be done while protecting the right to own guns, according to an official on the call. Ryan said Democrats were trying to change the focus of the debate about the Orlando killings from gun control to terrorism “because they cannot stand on their terrorism record,” the official said. King has sponsored the House version of a stronger bill by Sen. Dianne Feinstein, D-Calif., that the Senate also killed. It would let the government block gun sales to suspected terrorists and allow an appeal by the would-be buyer after the transaction has already been denied. Republicans say the Cornyn measure protects gun owners’ constitutional rights. Democrats say giving prosecutors three days to prove a gun buyer is probably involved in terrorism makes it too hard to thwart firearms sales.